Today's post is on the short side simply because I'm currently knocking out some Unperfected rewrites while also planning a new post series for you guys. Today's post might also be on the lame side. Sorry not sorry. Last week while I was at work (I'm a nanny) I was outside with the baby playing near the sandbox. The family I work for lives in an apartment complex right at the edge of the woods, so there are these huge trees that stretch over this sandbox. And trees = bees. Lots of bees. Lots of bumblebees, which I hate. They buzz around constantly and I'm always afraid one will land in my hair. Anyway, every so often there will be a dead bumblebee on the ground that I'll notice and avoid. I saw one while I was playing with the baby in the sand. I couldn't tell if it was dead or dying until two ants came over and started trying to drag this giant bee away. I smiled to myself as I watched these tiny little ants trying to move this colossal bumblebee. There was no way they'd budge it! After taking a walk around the complex with the baby, we came back to find a few more ants helping the other two move the bee. They had actually made about an inch of progress, which kind of struck me for a moment. These ants were not giving up, even though this bee was huge and could possibly take them all day to move back to their hills. I took the baby inside and moved on with the day. And then when I went back outside to walk to my car to go home, I was shocked. The bee and the ants were gone from the spot on the sidewalk. The ants had moved this giant bumblebee over ten feet back to their anthills in the grass! So naturally, I walked away from this comparing the whole thing to writing. 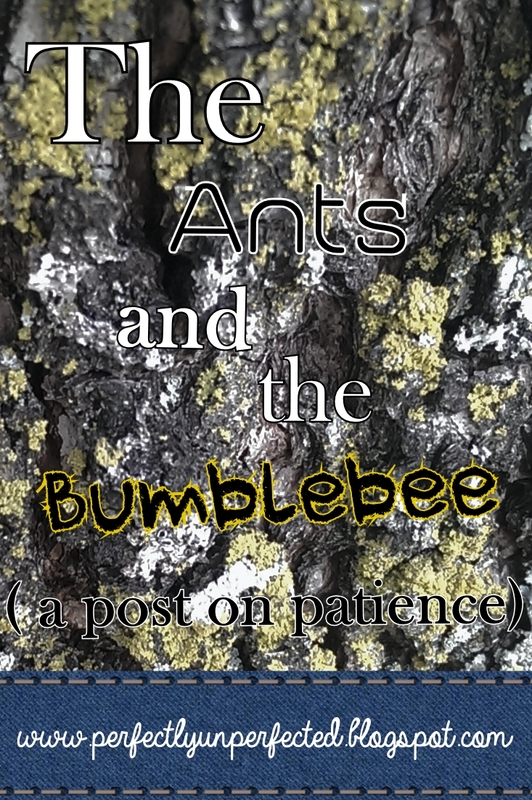 We writers are ants. We're these tiny little creatures with big hopes and dreams that can seem small and insignificant to others. Our stories and writing journeys are our bumblebees! They're huge. They're scary. And sometimes, it can feel like they aren't going anywhere. But that's just not true. Because when we ants band together through encouragement, positivity, and helpfulness, it's amazing what can happen! Over time, our bumblebees will start to move. We'll see improvements in our writing, or have confidence in our books, or maybe even take a step closer to publication. It's all just a matter of time, patience, and perseverance. So don't give up! 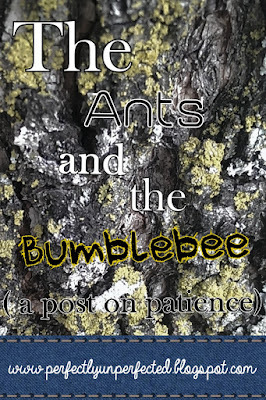 Be like the ants and make your bumblebee move. It'll can only get easier if you try! So yeah. That's my introspective little lesson for the day. As I said before, I'm working on a new post series, so keep an eye out for that! Until then, happy writing! Love this post! I think it's neat how you were able to turn this small moment into a really solid writing lesson. It's definitely something I need to remember(I tend to be a loner when it comes to writing... or just about anything), so it was a nice reminder today. Can't wait to see the new post series!